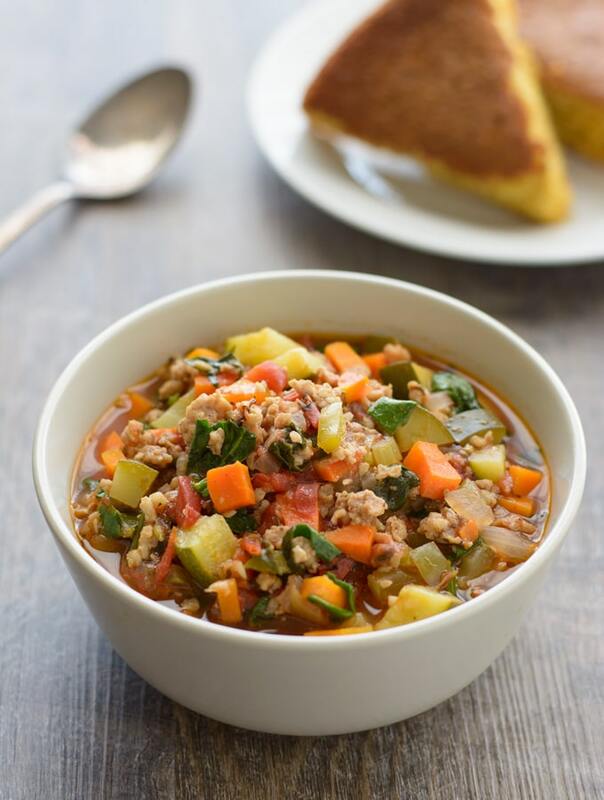 This Italian Sausage Vegetable Soup is delicious on it’s own, but serve up some cornbread on the side, and you have one really hearty meal! I’m not quite ready to let Summer go, but I AM really looking forward to soup season! We had a slight temperature drop this week due to a cold front that came through. Not much cooler, but still. I had a bunch of veggies in the fridge and pretty much everything I had went into this soup. I used pastured-raised Italian chicken sausage in mine, but you can use whatever your favorite sausage is. Mild or spicy. If using spicy, you will probably want to omit the red pepper flakes. This is a quick and easy soup recipe that is similar to my Sausage, Zucchini and Spinach Soup . That is one of the most popular recipes on my blog, so I decided to recreate it with a few minor changes. I can’t have soup without some homemade Skillet Cornbread alongside it, so I made up a pan of that, too . So good! Make some for yourself. You won’t be disappointed. Unless, you like sweet cornbread. In which case, you might be. We don’t put sugar in our cornbread here in Texas. No way! That’s called dessert, not cornbread around here. I did make mine a bit healthier by using ghee instead of the shortening that many old recipes call for. Oh, and it’s also gluten-free! 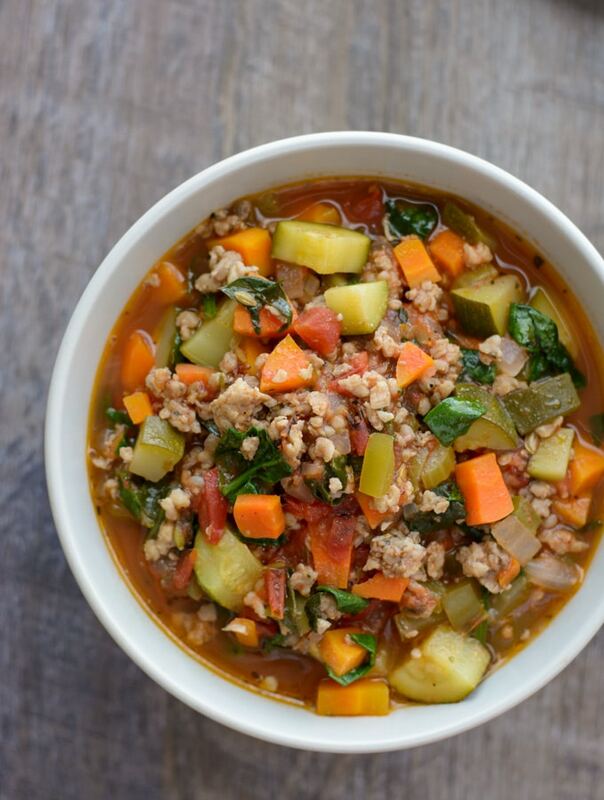 Before you know it, the chilly Winter weather will be here, and the recipe for this Italian Sausage Vegetable Soup will be great to have on hand! 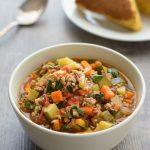 This Italian Sausage Vegetable Soup is a healthy and hearty soup that goes great with some homemade cornbread. Heat one tablespoon of ghee or olive oil over medium-high heat. Add the sausage and begin breaking it up as it browns. Add the celery, onions, carrots and peppers to the pot and cook, stirring occasionally, until the vegetables begin to soften, about 5-8 minutes. Add the minced garlic and cook for a minute more. Add the crushed fennel, garlic powder and stir to coat the meat/veggie mixture. Add the tomatoes, water and zucchini to the pot. Bring to a boil, reduce heat to a simmer, partially cover and cook until veggies are tender, about 20 minutes. Add the baby spinach and stir to wilt. Check seasoning and adjust if necessary. Serve immediately. Because the sodium content of sausage can vary, I recommend waiting until the end to add salt if needed. If using spicy Italian sausage, you will probably want to omit the crushed red pepper flakes. A handy method of crushing whole fennel seeds by hand: Place them on a cutting board, put a little olive oil on them to hold them in place and chop into small pieces with a knife. Or use a spice mill if you have one.